As a beauty lover, I am constantly trying out new skin care products. Face masks are something I try to incorporate into my nightly routine twice a week – sometimes more. While I do have some favorites that are constant staples in my rotation, these are my current favorites! Peter Thomas Roth Pumpkin Enzyme Mask $58 – I have sensitive skin, so I only use this once a week but it’s an incredible product. Instead of using it as a traditional face mask, I use it more as a exfoliating treatment. I apply to skin and rub gently for about 60-90 seconds. It helps even the appearance of skin tone, smooth the look of fine lines and wrinkles. While the price point is a little on the higher side, a little goes a long way and this will last you. Garnier Moisture Bomb Sheet Mask $3 – This is one of my favorite drugstore face masks! At only $3 each, it’s priced great, but best of all – this leaves your skin so smooth and moisturized! It’s also water based which I love. Glow Recipe Watermelon Sleeping Mask $22 – The scent alone will make you want to purchase this – it smells soon yummy. I’m a big fan of Korean Beauty and this product is a must in my opinion. It can be used two ways: a wash off mask + a sleeping mask. 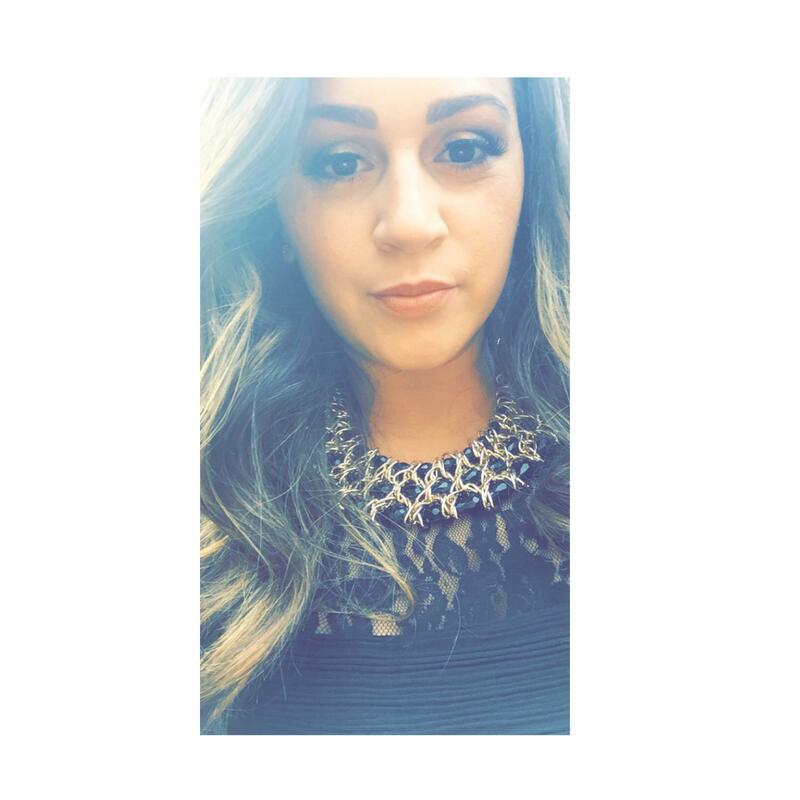 I use it only as a sleeping mask and it’s light weight and super hydrating. Derma-E Charcoal Mask $20 – This is one of my favorite Charcoal Masks. I have sensitive skin so I like to only leave on for only 2-3 minutes and then I wash off. My face instantly feels cleaner and glows. When Travelmate Sheet Mask $7 – Travelmate is a bio-cellulose mask with sheet made from coconuts. As soon as you open the package you will see that there is serious serum overload which I love! My skin is instantly hydrated and rejuvenated. If you are a Costco member, they offer a fantastic variety pack for only like $20 which is awesome. Boscia Luminizing Black Mask $34 – This peel off mask is my go to. It is filled with powerful antioxidants like Activated Charcoal and Vitamin C. After removing my skin feels tight, pore minimized and leaves my face fresh and clean. In the beginning of the year I made a promise to myself that I would find more time for self-care. Sometimes us women get so caught up in work, taking care of our household, kids etc. that we forget that we have to be in a good mental state to keep all those things going. Self-care can be anything from 5 minutes alone to a hot bath or even sitting in a cafe enjoying a cup of coffee while it’s actually still hot. 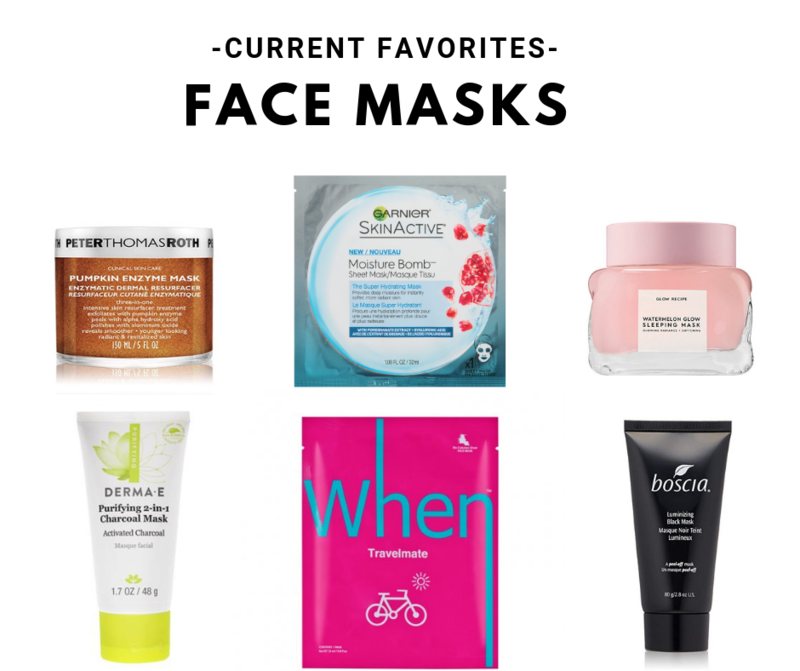 One of my favorite things to do for myself is weekly face masks so I wanted to share a few of my favorite ones with you guys. 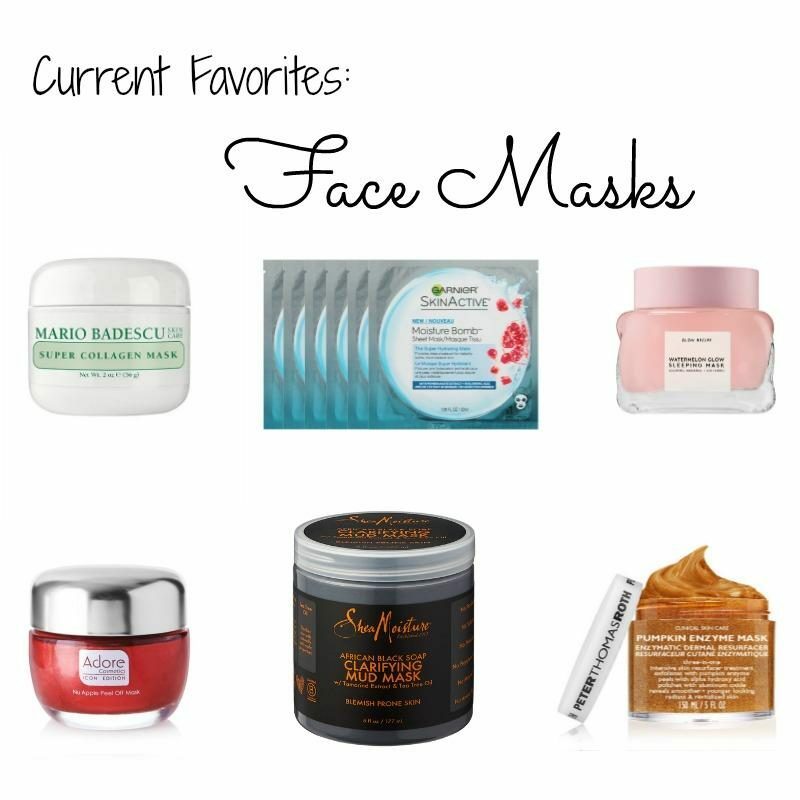 These 6 products are in my current face mask rotation depending on what I’m trying to achieve for my skin that week. I try to mask twice a week but even just once a week can make a big difference for your skin. Mario Badescu Super Collagen Mask $18 – This is a classic collagen and clay-based mask that is designed for dry, dull complexions in need of a lift. This collagen-enriched formula helps plump and smooth the look of fine lines to reveal firmer, smoother, more youthful-looking skin. I love the scent of this mask and the way it makes my sensitive skin feel and look after using it. This particular product is marketed towards more mature skin but I really think it’s one that can be used for less aged skin while still seeing results. Garnier Moisture Bomb Sheet Mask $4 – This water-based sheet mask with Hyaluronic Acid, an ingredient naturally found in skin, floods skin with intense, weightless hydration. It is free of mineral oil and petrolatum and with pomegranate extract, provides a soothing burst of hydration and a fresher, softer, more radiant look. There is a half bottle of hydrating serum in 1 mask! After each use my skin feels super hydrated and instantly radiant. Glow Recipe Watermelon Sleeping Mask $22 – The Watermelon Glow Sleeping Mask is a luxuriously bouncy, breathable sleeping mask that smoothes and perfects skin, overnight. This pillow-proof formula acts as a radiance-boosting hybrid hydrator, formulated with soothing, amino-acid rich Watermelon Extract, hydrating Hyaluronic Acid, and pore refining AHAs that work while you sleep to gently exfoliate and clarify. Besides the scent (which is friggin amazing!!!!) I love that this mask can be used 2 ways. You can use it as a sleeping mask by applying and letting it soak into the skin overnight or as a wash off mask for instant hydration and dewiness by applying for 10 minutes and rinsing off. Adore Cosmetics Nu Apple Peel Off Mask $135 – This ruby-hued peel off mask looks as juicy as a delicious red apple and immediately works to peel away at surface imperfections. Active antioxidant ingredients work deep into pores, locking onto dirt and debris. Then, the peel off action lifts them up, revealing brighter, better skin and fresher face. A powerful combination of ingredients including apple extract and Fruit Cell Culture work on surface skin cells for long-lasting skin brightening effects. In an instant, pores are deeply cleaned, skin is smoothed and left so so soft. At this price point, this is a higher end product but it’s worth the splurge. I love how clean my pores feel after using this mask and how firm my skin feels. Shea Moisture African Black Soap Mud Mask $16 – This clarifying mask draws out dirt and congestion while helping absorb excess oil and improve the appearance of troubled skin. A proprietary blend of African Black Soap and Raw Shea Butter helps to clarify, balance and soothe blemish-prone skin. After ever use my skin feels super clean and clear. One of my favorite things about this mask is how it really deep cleans my pores. Peter Thomas Roth Pumpkin Enzyme Mask $58 – This powerful, triple-action manual, chemical and enzymatic exfoliating treatment addresses a dull, aging, and congested complexion in three ways: exfoliates with Pumpkin Enzyme, reveals with Alpha Hydroxy Acid and polishes with Aluminum Oxide Crystals. Helps even the appearance of skin tone, smooth the look of fine lines and wrinkles and clarify to reveal skin that looks smoother, younger, radiant and revitalized. I have never met a PTR mask that I wasn’t in love with. This particular one is different in the sense that it’s basically a exfoliator and mask in one. I have sensitive skin so I only leave on for about 3 minutes but the results are incredible. You will notice a huge difference in your skin after only one use.